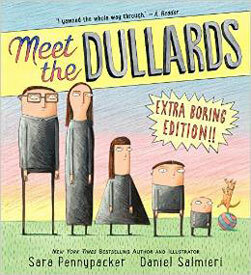 This is a boring picture book about a boring family. Their home is boring. Their food is plain. Their lives are monotonous. And Mr. and Mrs. Dullard like it that way. But their children—Blanda, Borely, and Little Dud have other ideas...get the 'Extra Boring Edition' (but hold the exclamation point). Pennypacker’s droll, deadpan text is matched by Salmieri’s flat and hilarious illustrations; the characters, with their elongated limbs and prominent eyes, might remind readers of Gru in the movie Despicable Me." The Horn Book - Robin Smith, APRIL 27, 2015.